The Great ShakeOut Earthquake Drill Booth! Do you know what to do in the event of an earthquake? Have you practiced how to protect ourselves? For more details come to our booth and learn more about earthquake hazards in California, the different types of tectonic settings, experiment with an earthquake machine, see a 3D printed California fault system, and more! 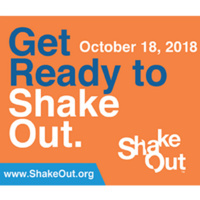 Then, participate in the Great California ShakeOut Earthquake Drill on October 18, 2018 at 10:18 AM!